Hello, my name is Jasmine Peratrovich. I am a senior at Cibola High School. I’m currently in a program called Healers of Tomorrow. The program teaches youth about the different medical fields. The program is paired up with the Institute of Native Health Initiative (NHI) where they are there to help our program and, help guide and assist with our presentations. We were asked to put on an event that will benefit our community. I decided to do a clothing line for Native American women who have sexual misconduct cases. I was inspired to do this knowing that there are so many women who have sexual misconduct cases- along with the Missing and Murdered Indigenous Women (MMIW) cases. What I would like for this event to do for my community is to raise awareness on sexual misconduct against Native women and bring awareness for the Missing and Murdered Indigenous Women. 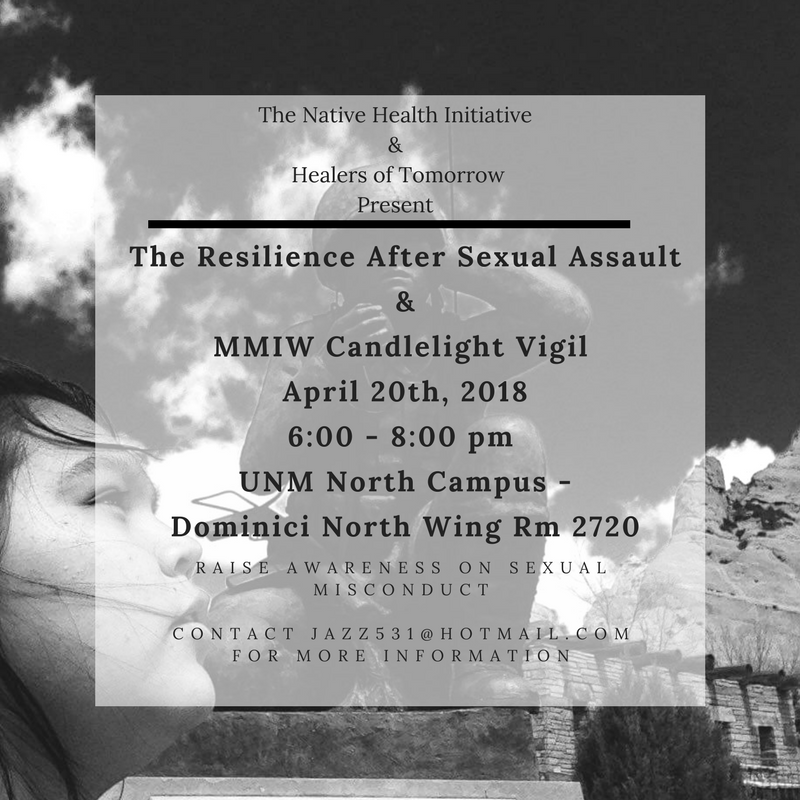 We will be having this event on April 20th, 2018 from 6:00pm to 9:00 pm at the UNM north campus. We are planning to set-up a clothing line, along with sharing women’s stories and providing blank t-shirts for others to write on. There will be guest speakers coming to present as well. After, I am also planning on having a candle light vigil for Missing and Murdered Indigenous women. What I want to accomplish in this event is to let women know that they are not alone and there is help all around. I want my community to connect to the women’s stories and feelings, and to let them know that Native American women are sacred and need better protection from those around them. I’m hoping that in a way this will help women cope but to really show and tell how they feel. I hope that this event will help raise awareness for these sacred women. I hope that my community will help bring justice for these sacred women. And, I also hope that this event will help others who are afraid to tell their story.